Background Modern cancer diagnostic work-up is based on multiple modalities within a short time period. The interplay between these modalities is complex and not well known. 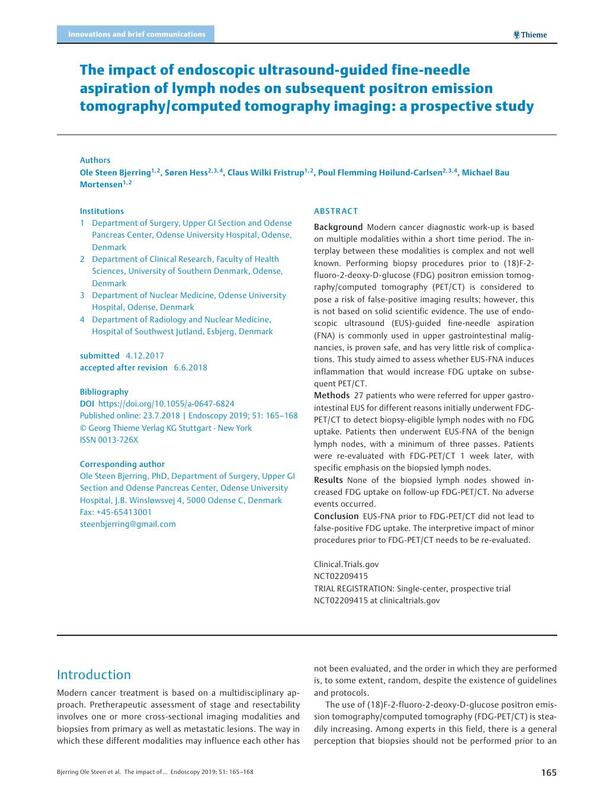 Performing biopsy procedures prior to (18)F-2-fluoro-2-deoxy-D-glucose (FDG) positron emission tomography/computed tomography (PET/CT) is considered to pose a risk of false-positive imaging results; however, this is not based on solid scientific evidence. The use of endoscopic ultrasound (EUS)-guided fine-needle aspiration (FNA) is commonly used in upper gastrointestinal malignancies, is proven safe, and has very little risk of complications. This study aimed to assess whether EUS-FNA induces inflammation that would increase FDG uptake on subsequent PET/CT. Methods 27 patients who were referred for upper gastrointestinal EUS for different reasons initially underwent FDG-PET/CT to detect biopsy-eligible lymph nodes with no FDG uptake. Patients then underwent EUS-FNA of the benign lymph nodes, with a minimum of three passes. Patients were re-evaluated with FDG-PET/CT 1 week later, with specific emphasis on the biopsied lymph nodes. Results None of the biopsied lymph nodes showed increased FDG uptake on follow-up FDG-PET/CT. No adverse events occurred. Conclusion EUS-FNA prior to FDG-PET/CT did not lead to false-positive FDG uptake. The interpretive impact of minor procedures prior to FDG-PET/CT needs to be re-evaluated.